Despite being a ship (models) enthusiast, this ship, the Empress of Britain, was hardly known to me until I made acquaintance with it as a diecast 1/1800 scale model, one of the six passenger liners in the pre-war no. 51 Meccano Dinky Toys Famous Liners Set. No. 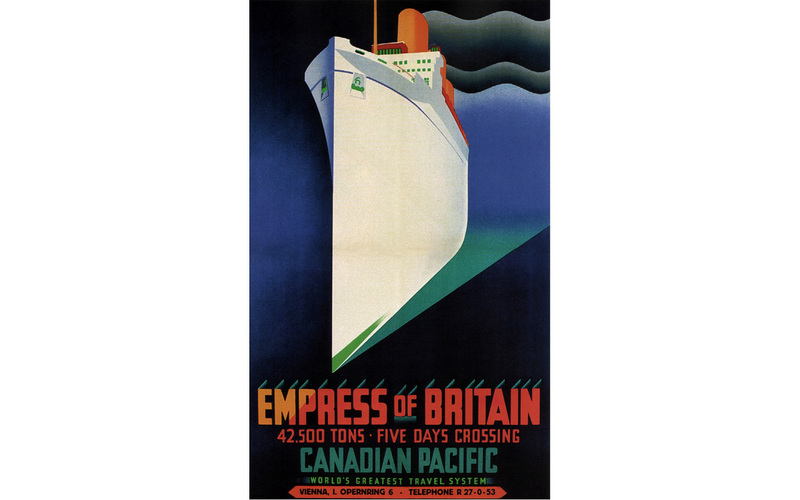 51d Empress of Britain was in reality a huge ocean liner and cruise ship of 42,348 GRT, which sailed the more northerly trans-atlantic route from England to Quebec in Canada for the Canadian Pacific Line (of the Canadian Pacific Railway Company). As seen from the front she looked rather square, but seen from aside the white hull and superstructure, crowned by three huge but still well-proportioned funnels, she had a gracious looks. 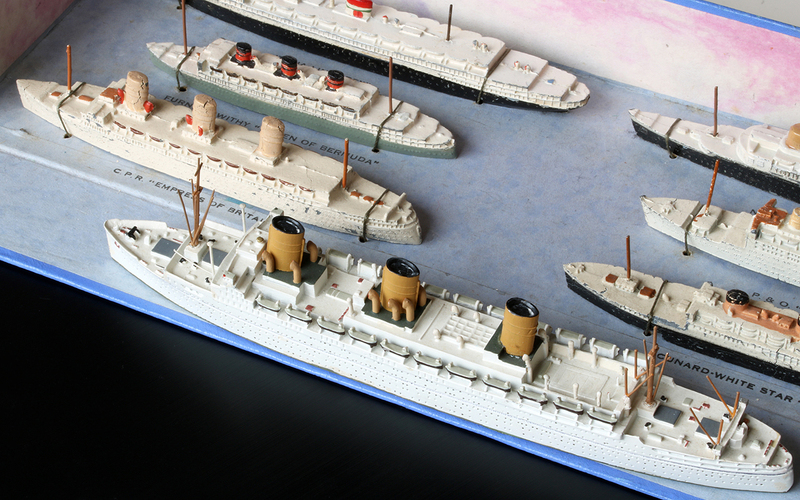 The Empress of Britain was the largest, fastest, and most luxurious ship sailing between England and Canada and she was just as new as the other ships represented in the Dinky set. 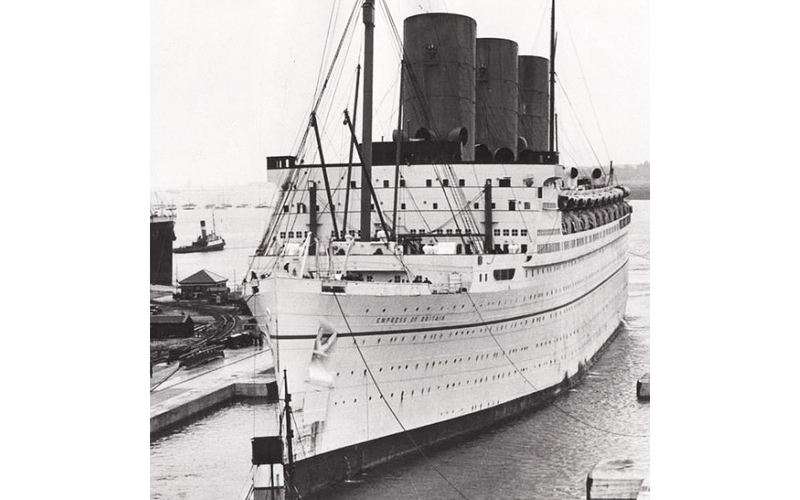 She was laid down in 1928, just before the big crisis struck the world’s economy, and entered service in 1931. With her up to the waterline reinforced stem and bow she could easily resist any incidental ice on the route. 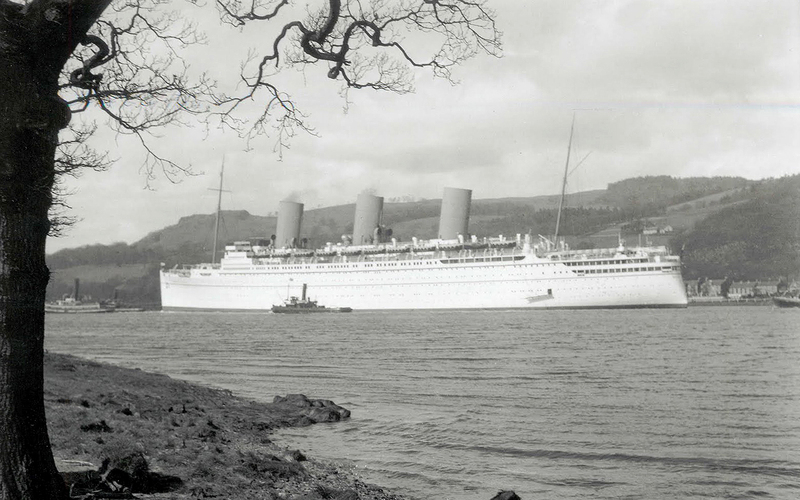 In winter, however, the Saint Lawrence is innavigable and therefore the Empress of Britain was annually converted into a first class luxury cruise ship, making cruises in warmer Mediterranean and tropical waters. Hence the all-white finish. The three ocher yellow coloured funnels of the vessel were enormous, about 20 m high and 10 m in diameter. 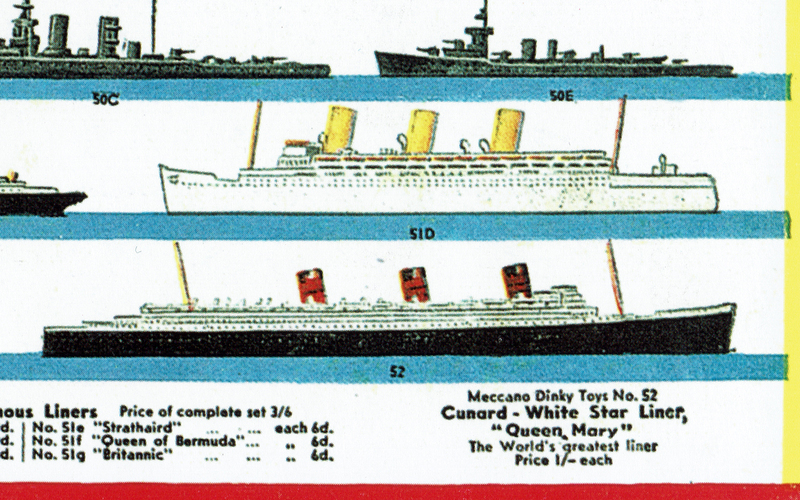 Like so many, this ship was often subject of nice publicity posters in art-deco style. Like the real one, the model is the third longest in the 51 series (130 mm), Europa being the longest (165 mm), followed by Rex (152 mm). However, in reality the Rex was the largest in gross tonnage. The model’s hull and superstructure are all white, like the impressive liner itself. 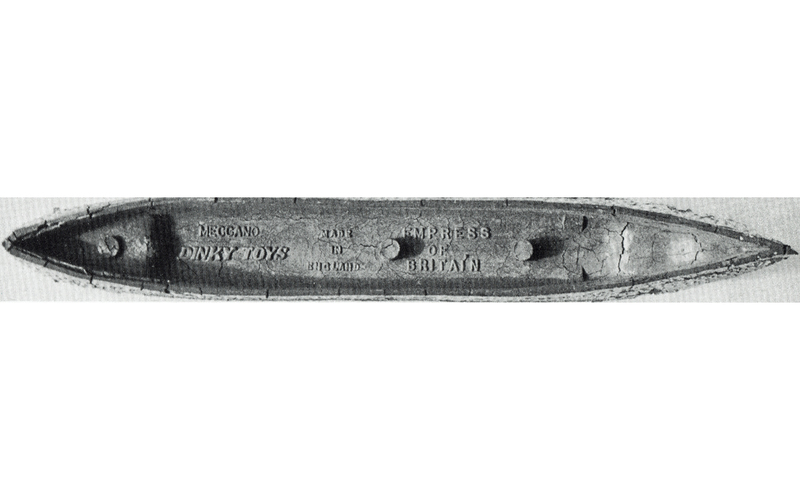 The life boats’ sides are accentuated with manually applied dashes of dark brown paint, the deck hatch-covers, wheel house roof and wire masts are painted mid-brown, and the air intakes are touched with dots of red paint. Apparently it was not feasible for Meccano to apply the tricky slim green line all along the hull and/or the more appropriate green tops of the life boats. I made this quick forum description because I was so happy to find a no. M 548 Mercator 1/1250 representation of this ship recently, which – in comparison – makes the differences between the Dinky Toy and the Mercator model obvious. Even if the larger scale – allowing for a 50% bigger model and more details – of the Mercator issue is taken into account, the concept of the Dinky model appears to be considerably less ambitious. More details have been left out than the inevitable generalization of the model’s features for the 1/1800 scale would have demanded. The Dinky was initially sold as a diecast toy after all, relatively cheap and compact, whereas the Mercator rendition is a heavy, vulnerable and more expensive collectors model, made in white metal. The Dinky Empress of Britain, introduced under the initial early Meccano Dinky Toys brand in 1934, is best known as part of the contents of the no. 51 set presentation box, which had several variations in the course of the 1930s. A separate model, however, was also available. They were sold by the retailer from trade boxes containing twelve models – which seem to be considerably scarcer nowadays than the full set presentation boxes. I cannot not show the details below the model properly, because mine is strung in its set box. Others may have better pictures available than the rather poor one in DT&MM.